Indulge in classic elegance, with this glittering 15 point diamond set band from Neil Lane's luxury couture bridal jewellery collection. Crafted in lustrous 14ct white gold with delicate milgrain detailing for a timeless feel. 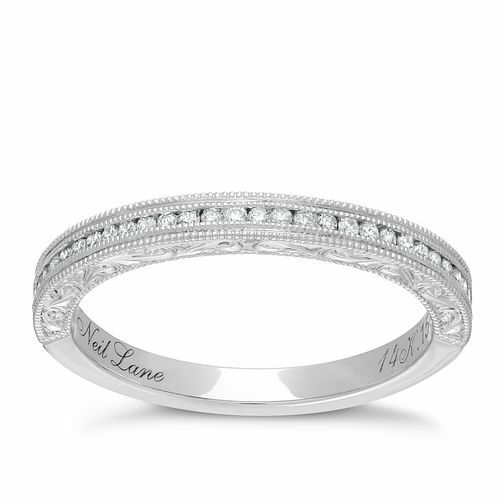 Neil Lane 14ct white gold 0.15ct diamond milgrain band is rated 5.0 out of 5 by 4. Rated 5 out of 5 by Anonymous from Gorgeous ring I chose this as my wedding ring, absolutely beautiful sparkles and pattern on the side makes it something different but gorgeous.